I have been thinking about a podcast on 2 Cor. 11.24, "Five times I have received from the Jews the forty lashes less one"; it is an interesting verse and Anthony Harvey has a good article on it. I am also planning to talk about this a bit in one of my classes on the Life and Letters of Paul starting next week. I did not expect to see in the Jerusalem Post (via Antonio Lombatti) that this week the same punishment would be doled out, "'Sinner' singer given thirty-nine lashes by rabbis". According to the report, the punishment was for performing in front of a "mixed audience". In the face of Worries for UK Theology and Religion departments, Helen Ingram has an excellent shout out, 101 Reasons to Study Theology and Religion: The Call for Comments. Helen herself is a University of Birmingham BA in Theology and PhD in New Testament studies and she speaks with authority as well as humour. I think she is right that university leadership often thinks of Theology and Religion as "soft touch" and I would add that this is often born out of ignorance. It's important for those of us working and studying in the sector to let the powers know what we do and why it's worthwhile. NT Pod 38: Who is the Beloved Disciple in John's Gospel? It's time I got up to date with posting the latest episodes of the NT Pod here also on the NT Blog. NT Pod 38 asks "Who is the Beloved Disciple in John's Gospel?" 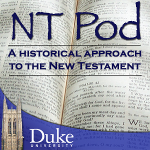 You can listen to the NT Pod online or subscribe in your preferred reader or subscribe via iTunes. Or, of course, you can follow the NT Pod on Twitter or on the NT Pod Facebook page. It adds a series of Excerpts from Frank Kermode's Writing. HT: James Tabor on Facebook. The Bizarre Case of Google Books Unavailable Outside the U.S. In my experience, most google books that are available in full view in the U.S.A. are not accessible outside of that country. I don’t even get ’snippet’ view of the ET of Wrede’s book. The publication date seems to make no difference. Particularly galling when, as I once noticed, a scan had been made at the Bodleian library in Oxford, but UK web visitors would be prevented from accessing the google book scan. Even worse when you live on the other side of the globe, with absolute no way of reading that book. The rest of us (i.e. those who do not live in google-land) can use proxy servers like hotspot shield to get around the problem – as long as you are prepared to put up with slow speed and annoying advertisements. Well, this was news to me. I am really surprised that books like this, over one hundred years old, are not showing up in some countries. I realize, of course, that copyright laws differ from country to country. Nevertheless, I am curious to know how widespread this kind of difference between Google Books at home and abroad is. Anyone else experienced this? Update (14.01): Roger Pearse comments. Is it just me or is Bishop Tom now sounding a bit more like Archbishop Rowan in the bishopy way he enunciates? Perhaps after a few months at St Andrews, that will all change and he will begin talking like Jim Davila. Sir Frank Kermode, who died on August 17 aged 90, was the most eminent critic of English literature since FR Leavis; his teaching career culminated in the senior English professorship at Cambridge University, a post he surrendered in 1982 in the aftermath of a widely reported doctrinal rift within the faculty. Update (15:13): James McGrath rightly notes that "sock puppets do not appear on biblioblogs nearly enough". Nor Mr Potatoheads, of course. James wonders whether the sock puppet versions of Sanders and Crossan in debate might be more popular than the real characters would be in debate. In fact, I've often thought it a shame that Crossan and Sanders have not had a good head-to-head debate, at least not as far as I am aware. Worries for UK Theology and Religion Departments? The report is attributed to a "staff reporter" and suggests that "University theology departments are facing a turbulent autumn with rounds of staffing cuts and closures." At this point is difficult to see if the concerns expressed are legitimate or not. Bangor's School of Theology and Religious Studies is mentioned, but it appears that the closure is in fact the result of a merger with the department at Trinity Saint David. The University of Birmingham's Theology and Religion department, my former home, gets a special mention too, with an unnamed "source" speaking about low morale. The rather vague nature of the claims, and the anonymity of the sources quoted, lead to some scepticism about the scale of the potential threat, at least at this point, but this will be one worth watching, especially in the light of the recent Sheffield and Gloucestershire situations. HT: Roger Pearse, but I completely dissociate myself from his extraordinary take on the report. Dr Hugh Houghton and Dr Damaris Romero Gonzales of ITSEE recently located microfilms of complete images of an important manuscript of the Latin Bible, Codex Complutensis I, which suffered major damage in 1936 during the Spanish Civil War. The microfilm, held at the Hill Museum and Manuscript Library, has been digitised and it is hoped soon to make the images of this virtual manuscript available through the Virtual Manuscript Room in Birmingham. A full set of pictures of the manuscript in its current state is available on the Universty of Madrid Biblioteca Complutense website. As James McGrath notes, a Biblical Studies Carnival has been spotted over on Jim West's blog, Zwinglius Redivivus. From what I recall, this is the first such carnival for a while; Tyler Williams's page records nothing for several months. So a big thanks to Jim for putting this one together with his customary eye for detail. It's a bit light on references to the NT Blog, but all you need to know about what's been happening here is some rambling about my trip to Israel and a discussion with several other bloggers about the future for online textbooks, a discussion that looks likely to run into August too.